Here is a small(ish) list of Linux CLI tips and tricks I have learned and researched over the years. This list is by no means completely comprehensive but contains a list of some of the tricks I use on an everyday basis. Living your life “in the shell” can be very cumbersome if you aren’t using the tricks outlined below. Good luck and happy Linuxing. I will say this: Do not give in and use all the tricks all the time if you are just starting with Linux. It’s always best (in my opinion) to learn the ropes and background to everything before using the GUI or any related tricks. I believe this is true with almost any learning process – technology-based or not. Tired of typing the whole path to a single command? Some commands can be very large and cumbersome. Try “tabbing it out”. The above should return whereis. If you have more than one binary in your path that contains the word where you may not get a result. In this case hit tab again and you’ll be presented with all options. The pwd command is useful to tell you what directory you are currently in. Depending on your shell configuration, you will be presented with your full working directory in the title of your shell program. 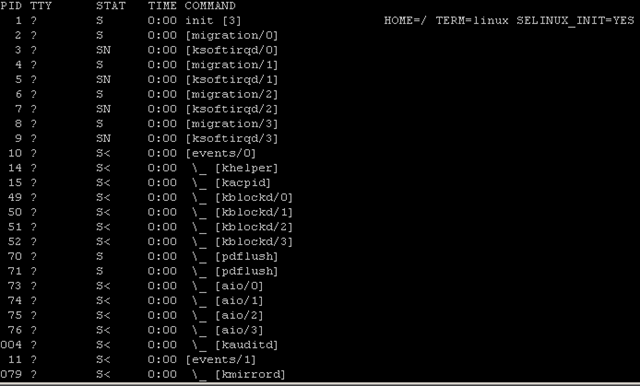 For instance, I use putty and it always shows my Current Working Directory (CWD). Forget what the last few commands you completed were? Want to diagnose a system and you have no idea what the person before you executed? Try the “history” command in Linux. Type “history”. This provides a list of all recently entered commands and can be very large. If you type “history 10” it works much like the tail command and shows the last 10 commands in history. Type “history –c” to clear your command history. Tons of information from the command you just executed? Redirect the output to a file or another program. I would still obtain the same results as explicitly telling the CLI to use STDIN (<). Using aliases is another way to make entering common commands easier. Think of an alias as a simple shortcut to a longer command. Let’s say you want to remove a directory and you’re tired of always typing “rm –rf <directory”. You can make an alias by typing “alias rmdir=’rm –rf’. Now you can type “rmdir <directory>” on the CLI and achieve the same result. Ever wanted to find a command but never knew the name? Do you know what the command does or a description but can’t put your finger on it? Use the command apropos to search the whatis database. Ever needed to find the location of a binary easily? Try “whereis”. Simply type whereis “binary” and you will be presented with a location to the binary and/or manpage for the given binary. There are a ton of other shortcuts I am missing but this is just a small list. Have a great day! Ever wondered what was going on with a server or desktop that just wasn’t performing “right”? Sure the load average is a good representation of the overall load as described here, but, how do you track down the actual source of the issue? Try out these five utilities to help you track down any load-related issues with your Linux-based installation. Yes, that’s right, good ol’ fashioned “top”. If you haven’t already used the top command then you may not have been using Linux that much. Top provides a real-time look at processor time, processes that are using high amounts of memory/CPU and also an overview of physical and swap memory. A preview of top can be seen to the right. Press “1” to show all CPU’s available (if running multiple-core processors or HT-enabled processors). There are also other top variants out there which can provide more information in the same “top-like” format. Enter htop. Htop has been around for quite some time and has, as far as I know, gone generally unknown around the Linux world. htop provides colorful (who doesn’t like colors?) views of the system state and shows tree views for processes that provide even more detail. 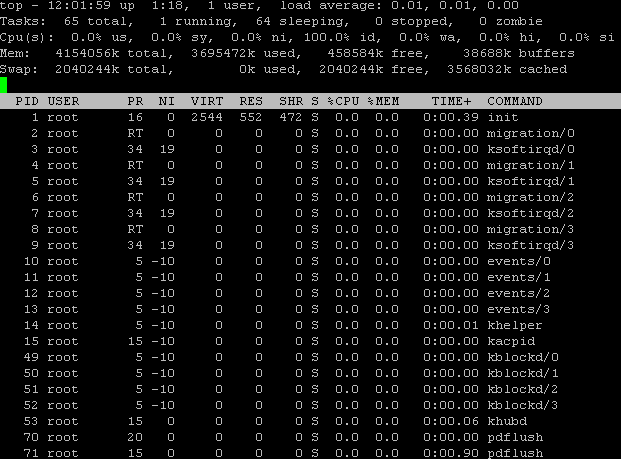 A screenshot of the htop interface can be seen on the right. Obtain more information about htop here. Got disk performance issues? Find out with iostat! iostat is used for monitoring speed, ops/sec and cpu time spent waiting on input/output devices to respond. This command is quite useful when attempting to see what is causing your load averages to spike. If your system has high i/o wait times you may consider purchasing faster disks or tuning the performance of your application to be less disk-intensive. Performance tuning, for instance, of a MySQL database can greatly decrease the amount of disk i/o needed. Adding indexes and re-constructing queries can speed up MySQL systems that have high i/o wait times. Of course, you can always throw hardware at the issue as well. For more information on iostat see this article. Direct from the vmstat man page: “vmstat reports information about processes, memory, paging, block IO, traps, and cpu activity.” The data shown in vmstat is the average since last reboot. wa: Time spent waiting for IO. Prior to Linux 2.5.41, shown as zero. Although the ps “process list” command does not show real-time updates it can provide useful information as to why your system may be slow. I typically use the “aux” options that shows enough detail but also adding “ww” to the end of “aux” yeilds good results for long commands. Run “ps aux” and look for multiple processes. This is good for troubleshooting if a process like Apache or Exim have spawned many children and caused the system to slow. Use the “e” flag to show children in a tree format. "A new server for mid-size companies, the Power 560 Express, is due on Nov. 21. It uses a 3.6Ghz Power6 processor, comes in four-, eight- and 16-node configurations, and packs a hefty 384GB of memory. It’s designed for companies looking to run multiple applications on a virtualized system. It will be offered with Linux, AIX or i." IBM brings a new line of processors and machines to the market with unreal memory capacities. This recently came up when the Dell OpenManage storage service would not start on a Linux system. It complained that there were no more Linux semaphores available. Check out the article for more information.